I was fortunate enough to tour the Carraro House today. We all know it as the Tovrea Castle, it’s just one of my favorite icons that is a perfect example of the optimism that only the desert can conjure. It was not without pride that I could see our state flag flying proudly above. I love Arizona, I really do. The beautiful design of our flag inspires me, makes me feel like I’m home. I have always loved the independence, diversity, and frankly, the potential for a touch of true-believer-crazy that has, since inception, made up the fabric of this State. This is why I cannot keep silent about the recent immigrant legislation that has been passed and signed into Law by our Governor. This Law is, and I challenge anyone to debate this with me, a short sighted, racially driven, abhorrent miscarriage of the true will of the people, born out of fear, malcontent, rage and frustration. It does not reflect the ethics of the majority of the good and thinking people of this State. It MUST be repealed. Lets face it, if this is an illegal immigration law then just who is it that’s immigrating to our state? The answer is obvious of course. I can’t imaging a Canadian getting hassled under this law unless the Molson runs out at the bar and they get a bit verbal. This is the return to classic racism that rages against any relatively recent group of immigrant, from the Irish that did a lot of fighting and dying for the Republic in our Civil and Indian Wars, the Chinese who became persona non grata AFTER the Railroads were built, Italian Immigrants, like my Grandfather who altered his name because they weren’t hiring Italians, Japanese Americans who were deemed unwelcome after December 7th, 1941? Who’d I miss? A big list I’m certain. Don’t be fooled by rhetoric about Jobs or talk about taxes, services and crime. This Law will not fix any of that. I grew up in an agricultural family and worked with harvest crews in the lettuce, grape and melon fields. As a younger man I witnessed first hand as we relied on this labor force to pack the vegetables that fueled growth in this Valley for decades. Or the hard rock miners from Mexico that dug their fair share of Copper, or ranched side by side with the Anglo Cowboys. We must not forget that the Mexican Border began just a few block south of us not much more than 150 years ago. Nor should we forget the vast amount of contributions, not just in labor, but culturally, that have been made on our behalf, those that we take for granted and enjoy. Our office is in Downtown Scottsdale, where, in my childhood, there was a significant Mexican American populace who literally built this town, block by adobe block. Or the African-American Community, vibrant and important in leading civil rights changes that benefit us all. Or our beloved South Mountain Flower Gardens, now gone, but not forgotten, all cultivated by Nisei Japanese, many of which were relocated during the fear of WWII. Or every single Native American reference and moniker, ones that we parlay with ease but forget at what cost they came to the indigenous peoples that bare the burden of their use; or for that matter whose ancestors gave us our canals; the very bones of who we probably stand on unknowingly. So let’s call this Law what it is; a racist tool that targets people of obvious ethnic decent that should not be tolerated anywhere, especially in the State that would be NOTHING but for the generous, imaginative, hard working, crazy desert visionaries that bought so much to the collective event that is today’s Arizona. The Range-wars are over folks. General Pershing already fought Pancho Villa for his border incursion. You want to secure our border with Mexico, fine, that’s a different conversation with a different solution. I applaud a dialog and creative ideas that solve real Immigration problems, social and economic, that come with our current situation but turning our Civil Police into Border Patrol Officers is not the answer any more than singling out any obvious racial qualities of any person that would lead to inquiry and harassment. That’s not Arizona in 2010, that’s Alabama in 1963. We must speak up on this. We must not let OUR Great State be tarnished and divided by fear mongers, most by the way “Immigrants” themselves from other States. If you’re not certain about how you feel just think about it as you drive down Indian School Road, or look up at Piestewa Peak, or look up almost ANY street name in McCormick Ranch. We should be grateful for our diversity, we should celebrate the toil and effort of those who have helped shape it, and we should call out racism when we see it. To fail to do so will have us rewriting the fateful comments of Pastor Niemöller: First they came for the Mexicans, but I did not worry, because I was not Hispanic…. then they came for me, and there were no Proud Arizonan’s left to care. As Realtors (and as humans) we seriously and prominently display the Equal Housing symbol because we recognize the sacrifice that went into what it stands for, and necessity for the reminder, still to this day, of how very fragile the foundations of Liberty it represents are. Join us in raising your voice about this Law. 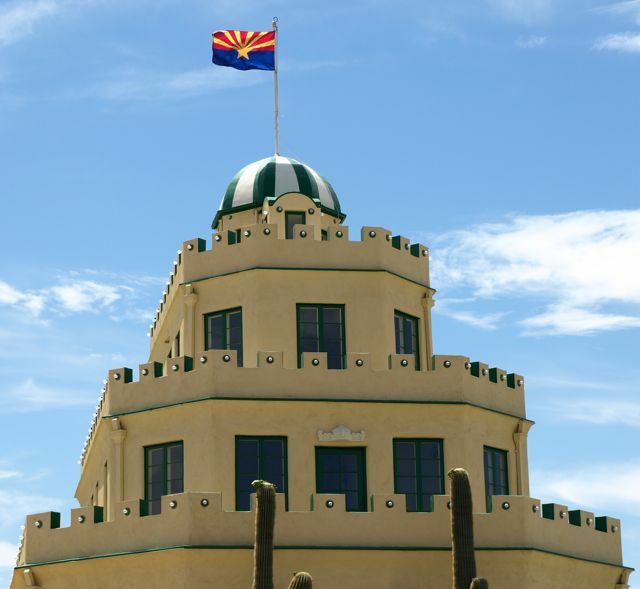 Then we can all see that flag fly over such dream-inspired places like the Carraro House and think with pride how it does fly for ALL of us in Arizona. Speak out against the Law.